Want an easy way to get started kayaking? Just KISS (Keep It Simple Saba)! Our Saba 9.5 Kayak has everything you need and nothing you don't. We've paid attention to all the important details so you can just grab this compact kayak out of your garage, throw it on top of your car and head for the water. Lightweight and extremely stable, the Saba 9.5 is designed for recreational paddling on all types of flat water—bays, lakes, ponds and rivers with slow-moving current. With a sit-inside kayak the low center of gravity makes it easier to paddle and you are more sheltered from cold water. Add an optional spray skirt (sold separately) for even more protection. The roto-molded polyethylene hull on the Saba 9.5 is flexible and impact resistant so it will take the rougher usage that most recreational kayaks endure. Dual tracking/stiffening channels have been added to the bottom for more responsive handling. The Saba 9.5 features a roomy cockpit making it easy to enter and exit. 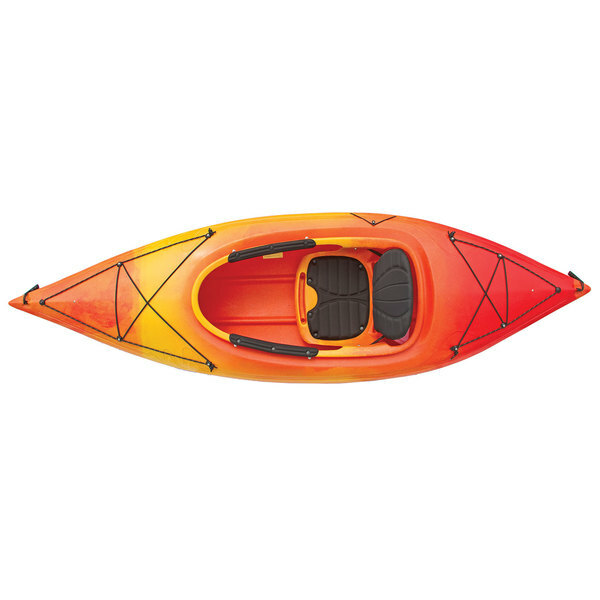 You'll find several details that make this kayak comfortable for most paddlers. Adjustable foot braces allow you to customize the cockpit for the length of your legs and give you the ability to adjust your leg position throughout the day. The combing is padded where your legs and hands rest and also adds extra comfort for carrying your Saba to the water. The roto-molded seat includes a high-back, adjustable, padded back support and padded bottom. The deluxe bow and stern rigging give you places to stow items like dry bags (sold separately), jackets and other essentials within easy reach. Bow and stern handles not only help with carrying, they also provide handy tie-off points when you want to get out and explore a remote island, break for lunch at a sand bar or dock with other kayaks or boats. You'll also find a paddle park system and static perimeter lines.